Intergrity Five Gallon Automatic Tea Brewer • Wire grid in stainless steel brew chamber suspends tea above orice to prevent clogging for loose leaf or pillow pack brewing. • Exclusive design provides easy access to components for quick service. • Ready-to-Brew light indicates the proper water temperature to eliminate guesswork in brewing. • High-quality, easy-to-clean stainless steel construction and convenient tank heater on/off switch provides energy savings options. 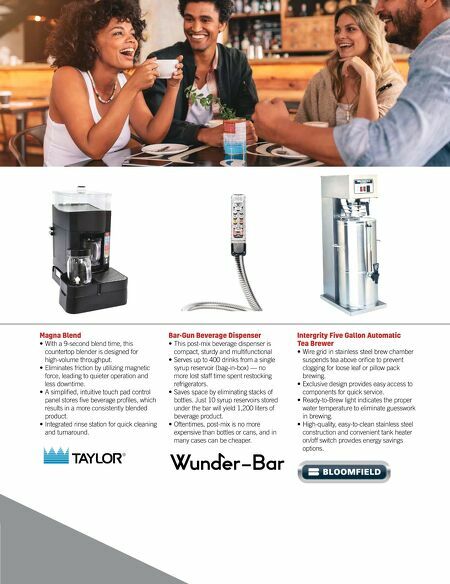 Bar-Gun Beverage Dispenser • This post-mix beverage dispenser is compact, sturdy and multifunctional • Serves up to 400 drinks from a single syrup reservoir (bag-in-box) — no more lost staff time spent restocking refrigerators. • Saves space by eliminating stacks of bottles. Just 10 syrup reservoirs stored under the bar will yield 1,200 liters of beverage product. • Oftentimes, post-mix is no more expensive than bottles or cans, and in many cases can be cheaper. Magna Blend • With a 9-second blend time, this countertop blender is designed for high-volume throughput. • Eliminates friction by utilizing magnetic force, leading to quieter operation and less downtime. 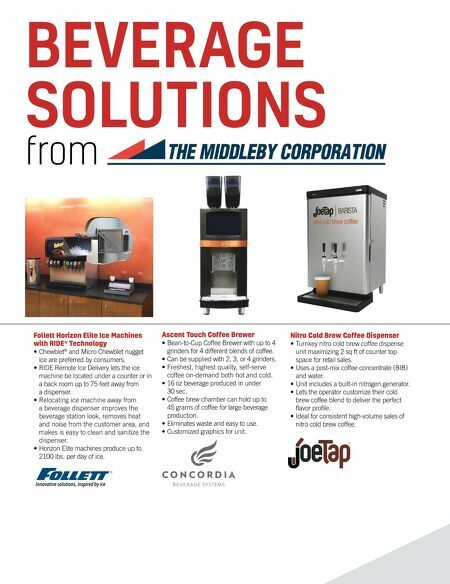 • A simplied, intuitive touch pad control panel stores ve beverage proles, which results in a more consistently blended product. • Integrated rinse station for quick cleaning and turnaround.